Spring is in the air and that can only mean one thing - a new uber 3D chip from AMD's graphics subsidiary, the ATI Radeon HD 4890. Well, that or widespread rioting in old London town courtesy of our mate Barry from across the pond. 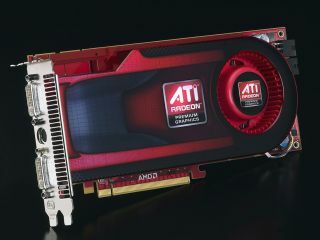 The Radeon HD 4890 was officially announced this morning – although its imminent arrival has been expected for a few weeks. It's AMD's fastest single-GPU graphics card, but is more of a mild overhaul of an existing GPU than an all new architecture. The chip itself is new, but functionally it's identical to the existing Radeon HD 4870. Of course, with no less than 800 shaders and 40 texture units, that's no bad thing. It also sports the same 1GB frame buffer and 256-bit bus as the top version of the 4870. Indeed, physically it's also very much a case of move along, nothing to see here. However, the exciting news is that we managed to overclock the chip's core operating frequency from 850MHz to 965MHz. It's still slightly behind the raw graphics grunt of the Nvidia GeForce GTX 285 then, but at around the £200 mark, the 4890 offers astounding value for money.